Are you looking to improve your smile by straightening crooked teeth, but perhaps you really don’t want to go through 2-3 years of braces? 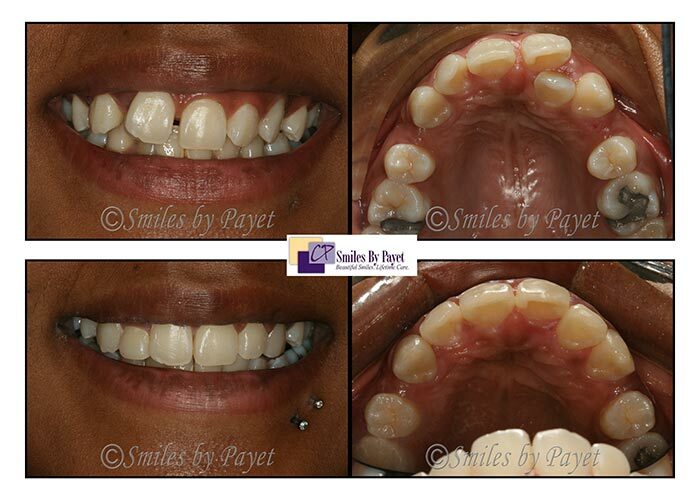 While we can definitely help with complicated cases by using InvisalignTM, the clear alternative to braces, for patients who have more limited goals, Powerprox Six Month Braces is a great option! Often, the patients who come to us for Six Month Braces aren’t looking for a “perfect” smile, which they know would take comprehensive orthodontic treatment. They aren’t looking for a perfect bite, because they can already chew just fine, don’t have any pain, but they are often unhappy and lack confidence in their smile. With that in mind, there is nothing “wrong” about providing improvement, even if it falls short of “perfection,” as long as we do no harm to the patient. LS came to us to see what we could do about the severe crowding in her smile. After a thorough exam, it was explained that she realistically needed comprehensive orthodontic care, that would probably last 18-30 months. However, she absolutely refused this option; after further discussion of pros and cons, we ultimately decided simply to treat the top teeth only, with a treatment time goal of about 9 months. We both knew in advance that the final result would be a compromise and less than ideal, but I did tell her we would make a big improvement. And as you can see, we did! J.B.’s job puts him in front of the public on a regular basis, and he’d always been unhappy with his smile. Due to various reasons, we opted to again treat just the top teeth, as he doesn’t show the bottom teeth, and his bite would not be affected negatively. As you can see, he has good reason to smile now! As you can see from both of these examples, it’s possible to make a big improvement in your smile without having to go through 2-3 years of braces. Yes, both of these patients would have benefited from having comprehensive orthodontic treatment, that is not in question. But since both of them flat-out refused, and we knew that there would be no unexpected complications, we gave both patients a big smile they can feel good about, in a reasonable time, at a reasonable fee. Tell us what you think in the comments! Share on Facebook, +1 on Google+, Tweet it on Twitter, or share however you like!